Scan – QR Code and Barcode Reader is a Windows 8 app to scan QR code via webcam. Where QR code scanning is generally considered related with smart phone, this Barcode scanner Windows 8 app lets you decode QR codes in seconds using webcam on your Windows 8 machine. Unlike other QR code decoders, the involvement of cam in this Windows 8 Barcode scanner app makes things a bit interesting. You don’t require taking a snap of QR code on the product and then scan the image using some other decoder app. You don’t even require clicking on any ‘Scan’ button. In this way it becomes one of the fastest and highly convenient Windows app to scan QR code. Before launching Scan – QR Code and Barcode Reader app, you will have to ensure that the webcam is connected and operational. On first, launch you will be prompted about allowing the app to access your webcam. To continue, you will need to click on ‘Allow’ button. 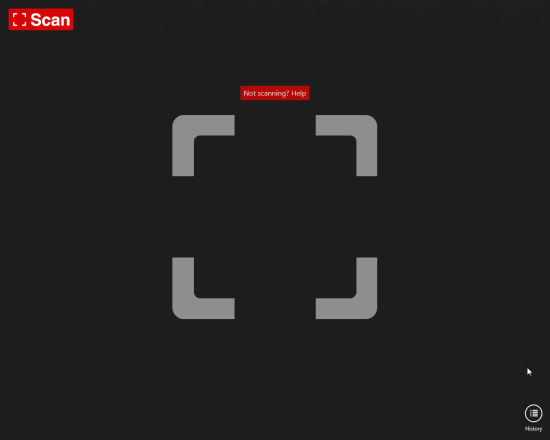 Now, all you need is to move the cam and bring the QR code within crosshairs. Scan – QR Code and Barcode Reader Windows app to scan QR code via webcam is quite efficient in detecting QR codes. All you need is to focus the QR code in a way that it gets enclosed within the rectangular section. The decoded text will appear instantly on the screen. It the decoded string is a URL then you can opt to open it in your default browser. In case of phone numbers, contact info, or email addresses you will be prompted about the supported operation. To view the details of previous scans made by you; click on ‘History’ button placed on bottom-right section of the interface. Also, check out our posts on Avast Antivirus, and QR Code Designer For Windows 8. 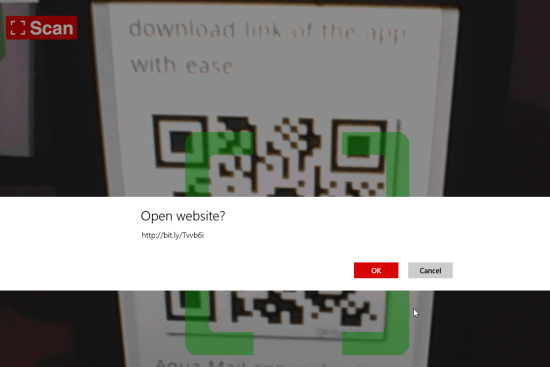 For installing this Windows app to scan QR code via webcam, you will require opening this link in supported browser such as IE 10 or Advance. Then, click on ‘View in Windows Store’ button followed by a click on ‘install’ button upon being redirected to Windows Store. It must be noted that Barcode scanning was unavailable at time of testing Scan – QR Code and Barcode Reader to scan QR code via webcam. Another, advantage is that the app works offline with least dependencies. It is the probably the best QR code decoder for men without Smartphones in their hands.